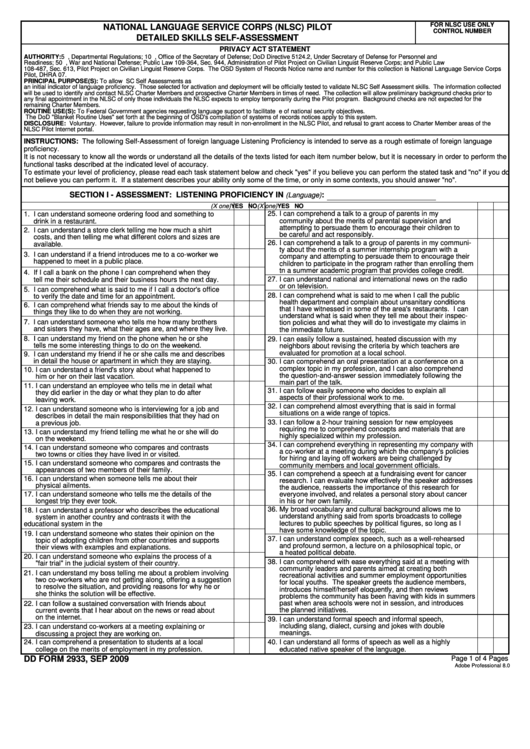 Download a blank fillable Dd Form 2933 - National Language Service Corps (Nlsc) Pilot Detailed Skills Self-Assessment - 2009 in PDF format just by clicking the "DOWNLOAD PDF" button. Complete Dd Form 2933 - National Language Service Corps (Nlsc) Pilot Detailed Skills Self-Assessment - 2009 with your personal data - all interactive fields are highlighted in places where you should type, access drop-down lists or select multiple-choice options. ROUTINE USE(S): To Federal Government agencies requesting language support to facilitate U.S. efforts on the war on terrorism or in furtherance of national security objectives. The DoD "Blanket Routine Uses" set forth at the beginning of OSD's compilation of systems of records notices apply to this system. functional tasks described at the indicated level of accuracy. not believe you can perform it. If a statement describes your ability only some of the time, or only in some contexts, you should answer "no". be careful and act responsibly. happened to meet in a public place. tn a summer academic program that provides college credit. tell me their schedule and their business hours the next day. to verify the date and time for an appointment. things they like to do when they are not working. and sisters they have, what their ages are, and where they live. tells me some interesting things to do on the weekend. evaluated for promotion at a local school. in detail the house or apartment in which they are staying. him or her on their last vacation. main part of the talk. aspects of their professional work to me. situations on a wide range of topics. highly specialized within my profession. two towns or cities they have lived in or visited. community members and local government officials. appearances of two members of their family. longest trip they ever took. in his or her own family. educational system in the U.S.
have some knowledge of the topic. their views with examples and explanations. "fair trial" in the judicial system of their country. she thinks the solution will be effective. discussing a project they are working on. college on the merits of employment in my profession. educated native speaker of the language.